WASHIGNTON, D.C. (Sept. 11, 2017) -- Legendary surgeon Dr. LaSalle D. Leffall Jr. was recently honored with the Howard University College of Medicine Distinguished Alumni Award at the 2017 National Medical Association annual convention in Philadelphia. 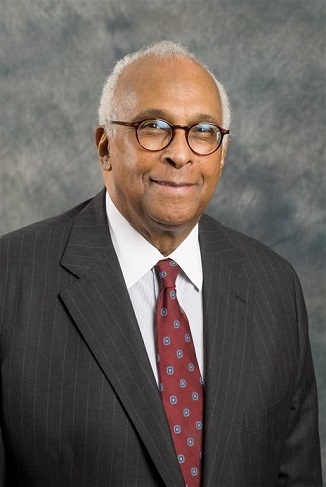 Dr. Leffall’s professional life has been devoted to the study of cancer, particularly among African-Americans. As national president of the American Cancer Society, he launched a program on the challenge of cancer among Black Americans in 1979. Dr. Edward Cornwell, Chairman of the Department of Surgery presented the award at the College of Medicine Alumni dinner on July 31. Dr. Leffall is the Charles R. Drew Professor of Surgery in the College of Medicine. He was born May 22, 1930, in Tallahassee, Fla. In 1948, at the age of 18, he was earned a bachelors of science degree from Florida A&M College. In 1952 he earned a medical degree from Howard University College of Medicine and completed his surgical training at Freedmen’s Hospital (the forerunner of Howard University Hospital). Dr. Leffall has been awarded 14 honorary degrees from universities across the United States. The Howard University Press published Dr. Leffall’s memoirs, No Boundaries – A Cancer Surgeon’s Odyssey in 2005 and a second 2014 book, Equanimity Under Duress: Calmness and Courage In the Battle Against Cancer. He co-authored this year’s Education, Excellence and Exemplars with Drs. Frederick and Cornwell. Dr. Leffall has lectured at more than 200 medical institutions across country. A Washington Post article noted that Dr. Leffall has taught more than 6,000 medical students and trained more than 300 surgical residents. Dr. Leffall retired from performing surgery nine years ago. He remains on the faculty as a lecturer and resource at Howard University.